I started out planning to expand the functionality of my program NameCheck. However, halfway through the first attempt to create the new version I realized that it was a mistake. The program that I was trying to create did not have the same goal as NameCheck. NameCheck was specifically written to find "cross contaminating" credits. By that i mean that you have "A credited as B" in some profiles and "B credited as A" in others. So I decided that this new this development was going to become its own program, now named CreditVariants. It was inspired by DJ Doena's plugin "Find Name Duplicates". If it had turned out to do exactly the same thing as his plugin, then I probably would have discarded it. It took me three tries to get the functionality that I intended. And when I compared it to DJ's plugin I was surprised to see how different it turned out to be. We clearly use different methods to find variants. DJ finds some that I don't find and I find some that DJ doesn't find. One marked difference is that DJ's plugin takes a l-o-n-g time to process the collection. That is (at least partly) because DJ processes both cast and crew. In this version I only target cast. I may add crew in a later version, if anyone asks for it. If you already have an XML export file, then CreditVariants is quite fast. Even if you have to do an export, it's faster than the plugin. I would suggest that you test both CreditVariants and DJ's plugin, so you can see for yourself which one does what. You can download version 1.0 of CreditVariants here. I released a program only to find a bug the very next day. I thought I had tested it well, and then I double clicked on a name that contained an apostrophy, and BOOM! Oh, well, that gave me a reason to implement a new feature at the same time as I fixed the bug. Entries with inconsistent names - that is, entries that need a common name fix - are now displayed in red (and italics, for those who may be color blind). Took the chance, got it, THANK YOU. a) The program is portable? - Download, extract, run. b) Before starting the program I am suposed to export the whole DVDP database to one large XML file at any location I want. - ? Yes and yes, sort of. I prefer to export just Owned, but you can export everything if you want. Or, if you want to keep an up-to-date XML export without any effort, you might take a look at DvdpScheduler. I personally use that to export my Owned collection every night, and take a backup twice a month. Edit: Actually when I think about it, you probably don't need the ClearAllFilters when exporting everything, just when you want to export a specifiy collection. Don't assume that the most common name in your collection is the most common name in the online database. 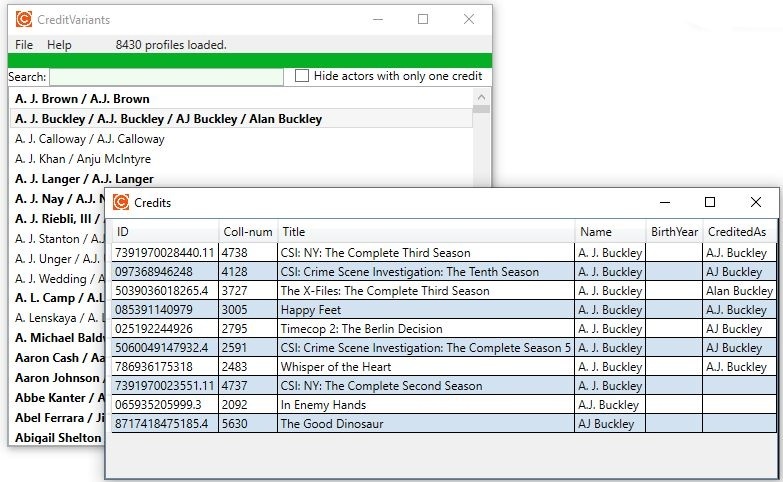 Looking at the example in my screenshot, I might assume that the common name should be "A. J. Buckley". 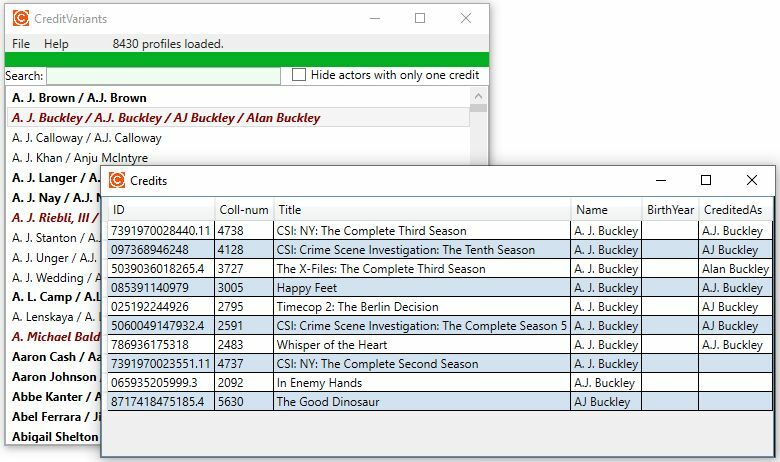 Not so, the most common variant according to the CLT is "AJ Buckley". So look before you leap! I downloaded your program today but ran into problems when trying to import my XML file. This is on a Windows 10 PC. Although CreditVariants does not use the crew information, the underlaying DLL that reads the XML file does expect it to be present. Try exporting everything, and the program should work, I hope. The post above was a middle-of-the-night answer, and perhaps a bit too brief. So let me explain a bit better. In a full export, there is always a section for crew. If there is no crew in the profile, there is still a placeholder, a <Credits/> tag. If you make an export with the Crew checkbox unchecked, there will be no placeholder in the XML file. That's what causes the problem. Had I been aware of this back when I created ProfilerData.dll I could have taken this in account. Going back in there now seems more work than the problem is worth. So, for now at least, it is a requirement that a full export is used. Thank you. It's working now, and I only had to export a limited number of crew so it had no noticeable impact on the export. Good to hear that it's working for you, Scott! Thanks for your feedback. The only problem now is all the time it's going to take me to fix my cast database. To sweeten things a little bit, I have included a help file now, in version 1.1.1.